Seats are still available online for the Tour of Champions taking place 7:00pm Sunday at Huskie Stadium at Northern Illinois University in DeKalb. Tickets can still be purchased online through 2pm Sunday. All tickets purchased now will be available at the Will Call window at Huskie Stadium. Onsite ticket sales and Will Call pick up will start at 3pm on Sunday at the Huskie Stadium box office. Parking is not available in front of the stadium, so please park in one of the lots and walk to the front of the stadium, or have someone drop you off while they wait in the car. 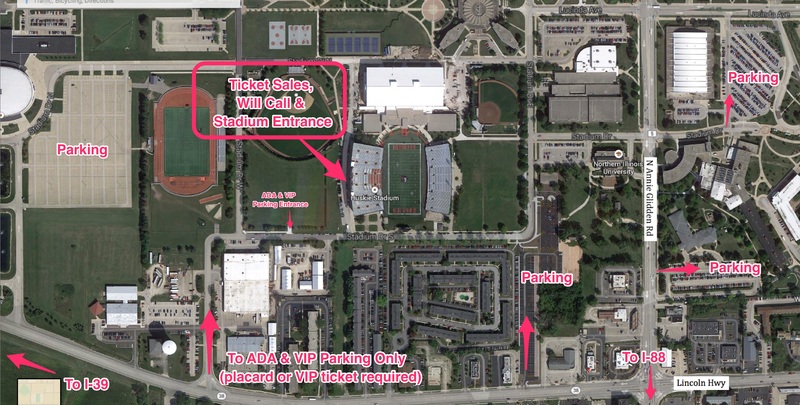 There are 3 other lots close to the stadium that are open to the public and easy to find on the map below. The closest lot to the stadium is accessed off of Lincoln Hwy. The next lot is located right off of N Annie Glidden Rd, and the third lot is off of Annie Glidden & Stadium Dr. The inside of Huskie Stadium is a series of tunnels. The best way to find your seat is to look at the seating diagram below. Find your section; your approximate row area and seat number. Then look for the closest corresponding gate entrance. Doing this in advance will save you time getting to your seat. When planning your arrival time, plan for parking, walking to the stadium and time to find your seat. The NIU Huskie Marching Band will perform the National Anthem at 7:00pm and the Blue Devils start the competitive portion of the event promptly at 7:10pm. The Phantom Regiment Alumni Association is hosting a pre-show gathering at Fatty’s Pub across the street from the stadium from 3:00 pm – 6:30 pm. Please join us as we reminisce with other alumni and phans.